This is the 2001 Italian paperback pocket edition of The First Eagle, the thirteenth Tony Hillerman Navajo Mystery novel featuring Joe Leaphorn and Jim Chee of the Navajo Tribal Police. This edition was published by Piemme in Casale Monferrato, Italy. The text was translated into Italian by Maura Parolini and Matteo Curtoni. 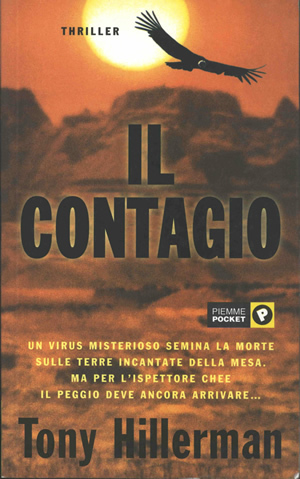 The title translates to "Contagion." It was previously published by Piemme in 1999 as "Il mistero della riserva indiana." The front cover of this edition, credited to Eva Cant, displays a photograph of a rocky mesa beneath a bright yellow sun. A silhouetted eagle soars above the book title printed in black. The back cover is orange and contains a brief synopsis and author biography printed in black, above the book bar code and cover credit. Format: Paperback, 21 x 13 cm. Binding: Full-color paper covers with photograph and title printed in black. The front cover photo wraps onto the spine, where the author name, book title, and publisher imprint are printed.